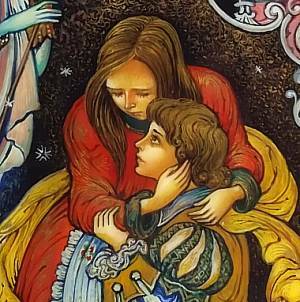 This box shows a very touching scene from the fairy tale of the Snow Queen, by Hans Christian Andersen. The Snow Queen has kept the lad Kay in her icy domain until Gerda, his neighbor and true friend, comes to rescue him, armed with tears and faith. Here, Gerda holds Kay in his arms, and the dispassionate Snow Queen looks on, clutching a long scarf in one hand, a long staff in the other. 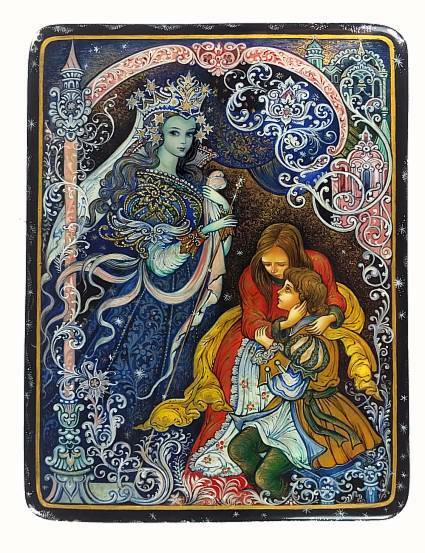 Smirnova painted just the top half of the queen, thus allowing the symbolic goodness of the heavens to come between her and the two children. 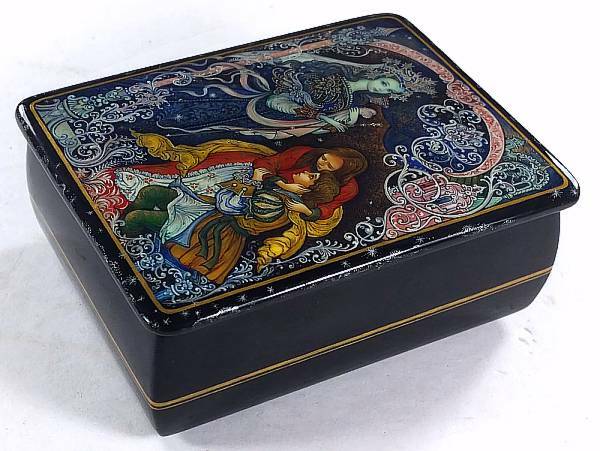 Throughout the box, all three figures seem to be cushioned by a swirling labyrinth of ornate pale blue lines. The striking gold accents on the clothing and hair of the figures themselves, especially Kay and Gerda, contrast sharply and set them apart. Perhaps due to the dynamic nature of the lines in the drawing itself, the sides are balanced with just a few simple gold lines. The box is made out of high quality papier mache and has a hinge at the left. The interior is red and it sits on four small legs. Signed with the name of the artist, village and year. A stunning work!